LEAMINGTON, ON, April 15, 2019 /PRNewswire/ – Aphria Inc. (“Aphria” or the “Company”) (TSX: APHA and NYSE: APHA) today reported its results, for the third quarter and nine months ended February 28, 2019. All amounts are expressed in thousands of Canadian dollars, unless otherwise noted and except for per gram, kilogram, kilogram equivalents, and per share amounts. I am proud of the efforts of our over 1,000 employees worldwide as we continue to position Aphria for future growth and success in the global medical and adult-use cannabis industry. Our organization has experienced significant change in a very short period of time which was necessary to propel the Company forward. Our Board of Directors and executive team will remain focused on the advancement of Aphria’s leadership position in the global cannabis industry and we are pleased to have announced today the appointment of two new independent directors. Aphria will continue to drive sustainable long-term shareholder value by leveraging its strong brand positioning, superior distribution model, product innovation, industrial scale cultivation and automation, medical-use leadership and strategic global platform. The Ontario Securities Commission requested as part of a continuous disclosure review that the Company perform an impairment test on its LATAM assets subsequent to the filing of the 2019 second quarter financial statements. As a result of this impairment test conducted by the Company, the Company determined that a $50 million non-cash impairment charge to the carrying value of the LATAM assets was required. The basis for this impairment arises from the Company’s reassessment of the discount rate and the financial forecasts for these entities as a result of new financial information received from the financial advisors to the Special Committee who reviewed the LATAM transaction. This new financial information consisted of lower gross margins and EBITDA margins used by the financial advisor for the Special Committee and recent financial information from the LATAM entities that showed higher than expected expenses. As a result of this new information, Aphria determined that the discount rate should be adjusted which resulted in the non-cash impairment charge to the carrying value of the LATAM assets. In a separate release issued today, the Company also announced that it has entered into a series of transactions that will accelerate the expiry date of the unsolicited offer launched by Green Growth Brands Inc. and will provide up to an additional $89.0 million of liquidity to the Company without dilution to shareholders. Please refer to this separate press release for the terms and conditions of this transaction. The Board appointed two new independent directors, effective today. Walter Robb and David Hopkinson will fill two of the three current director vacancies. 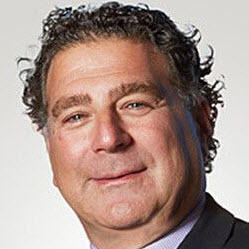 Walter Robb is an investor, mentor and advisor to next generation companies and as former co-CEO of Whole Foods Market, he brings to Aphria a long and varied entrepreneurial history ranging from natural food retailer to farmer to consultant. Mr. Robb joined Whole Foods Market in 1991 and in 2010 was named co-CEO, at which time he joined the Whole Foods Market Board of Directors. In 2017, he transitioned his leadership focus to his role as a passionate advocate for greater food access in underserved communities, serving as Chairman of the Board for Whole Kids Foundation and Whole Cities Foundation. Mr. Robb also serves on the Board of Directors for Union Square Hospitality Group, The Container Store, FoodMaven, HeatGenie and Apeel Sciences. David Hopkinson serves as Real Madrid Club de Futbol’s (“Real Madrid”) Global Head of Partnerships. He joined Real Madrid in August 2018 and brings his 25 years of professional sports sales, marketing and leadership experience to Aphria. Mr. Hopkinson began his career in professional sports in Toronto, Canada where he ascended from an entry-level day one employee with the NBA’s Toronto Raptors to Chief Commercial Officer of MLSE, who are owners of the Raptors as well as the NHL’s Toronto Maple Leafs, MLS’s Toronto FC, the CFL’s Toronto Argonauts and the NBA2K league’s Raptors Uprising Esports team. He also serves on the Chancellor’s Advisory Committee for McGill University in Montreal. In 2012, David was awarded the Queen Elizabeth II Diamond Jubilee Medal in recognition of his contributions to Canada. Net revenue for the three months ended February 28, 2019 was $73.6 million, compared to $21.7 million in the prior quarter and $10.3 million in the same period last year. Higher revenue in the quarter was driven by $57.6 million of distribution revenue from CC Pharma and ABP. Net revenue includes over 1,329 kilogram equivalents sold for the Canadian adult-use market and 1,274 kilogram equivalents for medical cannabis sales. The decrease in cannabis revenue and kilograms sold compared to the prior quarter was primarily related to supply shortages as the Company transitioned growing methods during the late fall and early winter, as well as temporary packaging and distribution challenges. The average retail selling price of medical cannabis (exclusive of wholesale), before excise tax, increased to $8.03 per gram in the quarter, compared to $7.51 in the prior quarter, primarily related to higher oil sales. The average selling price of adult-use cannabis, before excise tax, declined to $5.14 per gram in the quarter, compared to $6.32 per gram in the prior quarter due to a shift to smaller package sizes to maximize SKU assortment and shelf space for the Company’s brands. Adjusted gross profit for the third quarter was $13.4 million, with an adjusted gross margin of 18%, compared to $10.2 million with an adjusted gross margin of 47% in the prior quarter. 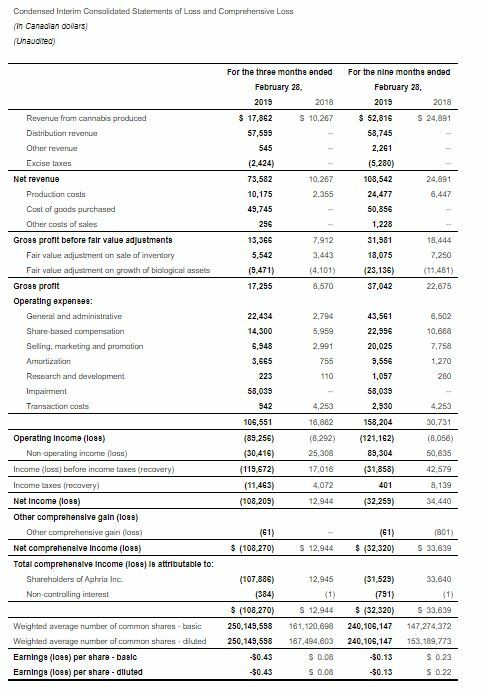 The decline in adjusted gross margin was primarily due to the increase in revenues from our distribution business which operates with lower gross margins than our cannabis business. In addition, the Company experienced a temporary increase in packaging and distribution costs as the Company awaits the industrial scale and automation in Part IV and Part V to become operational. Selling, general and administrative costs in the quarter rose to $106.6 million, from $27.5 million in the prior quarter and $16.9 million in the prior year. The increase was primarily due to the $50.0 million impairment for the LATAM acquisition, an increase in non-cash share based compensation, and the inclusion of a full quarter of LATAM and two months of CC Pharma. Net loss for the third quarter of 2019 was $108.2 million or $0.43 per share, compared to net income of $54.8 million or $0.22 per share in the prior quarter, and net income of $12.9 million or $0.08 per share for the same period last year. The decrease in net income relates to non-cash impairments of $58 million and additional non-operating losses of $30 million. Excluding the aforementioned non-cash impairment charges, adjusted net loss was $50.2 million, or $0.20 per share. 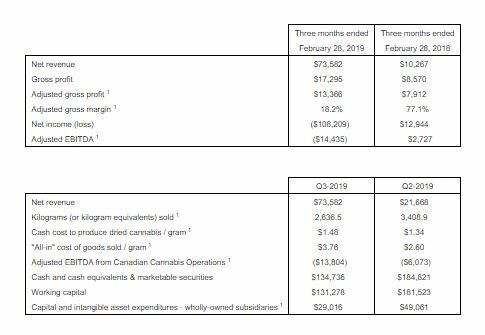 Adjusted EBITDA loss from Canadian cannabis operations for the third quarter was $13.8 million compared to a loss of $6.1 million in the prior quarter. 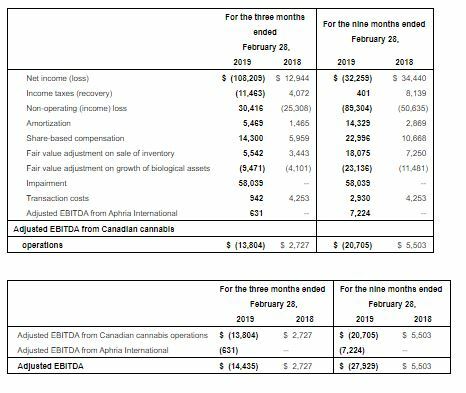 The adjusted EBITDA loss from Aphria International for the third quarter was $0.6 million compared to a loss of $3.5 million in the prior quarter. The increased adjusted EBITDA loss from Canadian cannabis operations in the third quarter is primarily attributable to an increase in general and administrative expenses to support the Company’s planned capacity expansions, as well as a higher overhead costs related to supply shortages, and a temporary increase in packaging and distribution costs for the adult-use market. In this press release, reference is made to adjusted gross profit, adjusted gross margin, adjusted net loss, adjusted EBITDA loss from Canadian cannabis operations, adjusted EBITDA loss from Aphria International, kilogram (or kilogram equivalents) sold, cash costs to produce dried cannabis per gram, “all-in” costs to produce dried cannabis per gram and investments in capital and intangible assets – wholly-owned subsidiaries, which are not measures of financial performance under International Financial Reporting Standards. Definitions for all terms above can be found in the Company’s February 28, 2019 Management’s Discussion and Analysis, filed on SEDAR and EDGAR. Aphria executives will host a conference call to discuss these results today at 9:00 am ET. To listen to the live call, dial (888) 231-8191 from Canada and the U.S. or (647) 427-7450 from International locations and use the passcode 9475768. A telephone replay will be available approximately two hours after the call concludes through May 15, 2019. To access the recording, dial (855) 859-2056 and use the passcode 9475768. There will also be a simultaneous, live webcast available on the Investors section of Aphria’s website at aphria.ca. The webcast will be archived for 30 days. Aphria introduced a new logo today to coincide the Company’s evolution from a licensed producer of medical cannabis in Canada to a leading global cannabis company. Aphria’s mission is to be the premier global cannabis company through an unrelenting commitment to our people, the planet, product quality and innovation. As the Company embarks on the next phase of its growth, the launch of this corporate brand signifies Aphria’s strategic focus on driving the transformation of the cannabis industry. The Aphria tri-colour logo, which has been in use since 2013, will continue to represent the Company’s flagship medical cannabis brand, Aphria, which has proudly supported nearly 70,000 patients across Canada and in medical cannabis markets around the world. Aphria is a leading global cannabis company driven by an unrelenting commitment to our people, product quality and innovation. Headquartered in Leamington, Ontario – the greenhouse capital of Canada – Aphria has been setting the standard for the low-cost production of high quality cannabis at scale, grown in the most natural conditions possible. Focusing on untapped opportunities and backed by the latest technologies, Aphria is committed to bringing breakthrough innovation to the global cannabis market. The Company’s portfolio of brands is grounded in expertly-researched consumer insights designed to meet the needs of every consumer segment. Rooted in our founders’ multi-generational expertise in commercial agriculture, Aphria drives sustainable long-term shareholder value through a diversified approach to innovation, strategic partnerships and global expansion, with a presence in more than 10 countries across 5 continents.